On August 1, 2014 our daughter Brittany’s life was changed forever. Brittany sustained an accidental gunshot wound to the neck. The bullet severed her corotid artery and shattered two vertebrae in her neck, resulting in a life-changing spinal cord injury. 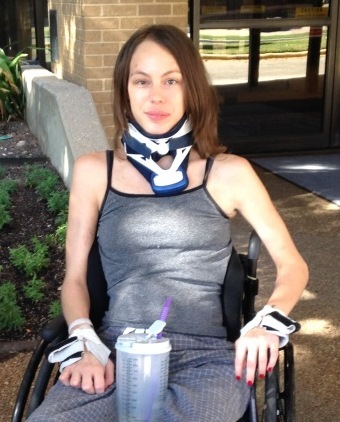 Brittany (26) is now a quadriplegic with no feeling below her clavicle and no use of her hands or legs. Currently, Brittany is working hard at the Baylor Institute for Rehabilitation. In spite of the many struggles she is facing, she has a strong and positive attitude. She is determined to make as much progress as possible and faces every day as a new challenge to conquer. Brittany was in ICU for over a month and has incurred over $300,000 in medical expenses. And although she has been approved for Medicaid, the continuing medical expenses will be well over what Medicaid will cover. Some of the immediate out of pocket expenses we are facing are home modifications, vehicle modifications, adaptive equipment, and additional rehab therapy which will allow Brittany to make as much progress as possible and give her some independence which she is striving for. This is where your assistance is greatly needed. To help with the financial burden of Brittany’s uninsured expenses, a fundraising campaign in her honor has been established with HelpHOPELive, a trusted nonprofit organization that has been providing community-based fundraising guidance to patients and their families for more than 30 years. All donations are tax deductible, are held by HelpHOPELive in the South-Central Spinal Cord Injury Fund, and are administered by HelpHOPELive for injury-related expenses only. Please consider making an end-of-year tax deductible contribution. Brittany is hopeful that with your help she will regain the use of her hands, and perhaps will someday walk again. Help us help her to have the life that everyone deserves. On behalf of Brittany and our family, we thank you for your kindness, support and generosity. Rena tells me you're doing awesome in physical therapy. Keep up the hard work and remember we're praying for you! You and your family and in my thoughts and prayers. Love you girl.